Last week I was at The Experts Conference in Frankfurt presenting at the PowerShell Deep Dive. My presentation was entitled “Maximize the reuse of your PowerShell”. My PowerShell library for managing Hyper-V has now gone through a total of 100,000 downloads over all its different versions but whether it’s got wide use because of the way I wrote it or in spite of it, I can’t say. Some people whose views I value seem to agree with the ideas I put forward in the talk, so I’m setting them out in this (rather long) post. I have never lost my love of Lego. Like Lego, PowerShell succeeds by being a kit of small, general purpose blocks to link together. Not everything we do can extend that kit, but we should aim to do that where possible. I rediscovered the Monad Manifesto recently via a piece Jeffrey Snover about how PowerShell has remained true to the original vision, named Monad. It talks of a model where “Every executable should do a narrow set of functions and complex functions should be composed by pipelining or sequencing executables together”. Your work is easier to reuse if it becomes a building block that can be incorporated into more complex solutions; and this certainly isn’t unique to PowerShell. Functions for re-use, scripts for a single task. If you a use .PS1 script to carry out a task it is effectively a batch file: it is automating stuff so that’s good, but it isn’t a building block for other work. Once loaded, functions behave like like compiled cmdlets. If you separate parts of a script into functions it should be done with the aim of making those parts easy to reuse and recycle, not simply be to reformat a script into subroutines. If we’re going to write functions how should they look? Choose names wisely, One task : One Function, there is no “DoStuffWith” verb for a reason. PowerShell cmdlets use names in the form Verb-Noun and it is best to stick to this model; the Get-Verb command will give you a list of the Approved verbs. PowerShell’s enforcement of these standards is limited to raising a warning if you use non-standard names in a module. If your action really isn’t covered by a standard verb, then log the need for another one on connect; but if you use “Duplicate” when the standard says “Copy”, or “Delete” when the standard says “Remove” it simply makes things more difficult for people who know PowerShell but don’t know your stuff. The same applies to parameter names: try to use the ones people already know. Getting the function name right sets the scope for your work. For my talk I used an example of generating MD5 hashes for files. My assertion was that the MD5 hash belonged to the file, and so command should return a file with an added MD5 hash – meaning my command should be ADD-MD5. Output: Use the right Out- and Write- cmdlets Other speakers at the Deep Dive made the point that output created with Write-Host isn’t truly returned (in the sense that it can be piped or redirected) it is writing on the console screen; so only use Write-Host if you want to prevent output going anywhere else. There are other “write on the screen without returning” cmdlets which might be better: for example when debugging we often want messages that say “starting stage 1” , “starting stage 2” and so on. One way to do this would be to add Write-Host statements and after the code is debugged remove them. A better way is to use Write-Verbose which outputs if you specify a –verbose switch and doesn’t if you don’t. As a side effect you have a quasi-comment in your code which tells you what is happening. The same is true when you use Write-Progress to indicate something is happening in a long running function, (remember to run it with the -completed switch when you have finished otherwise your progress box can remain on screen while something else runs). Write-Debug, Write-Error and Write-Warning are valuable, I try to prevent errors appearing where the code can recover and write a warning when something didn’t go to plan, in a non-fatal way. Formatting results can be a thorny issue: you can redirect the results of Format-Table or Format-List to a file, but the output is useless if you want to pipe results into another command – which needs the original object. Some objects can have ugly output: it’s not a crime to have an –asTable switch so output goes through Format-Table at the end of the function or even to produce pretty output by default provided you ensure that it is possible to get the raw object into the pipe with a –noFormat or –Raw switch. But it’s best to create formatting XML and a lot easier with tools like James Brundage’s E-Z-out. Select-String -Path *.ps1 -Pattern "Select-String"
looks at all the .PS1 files in the current folder and where it finds the text “Select-String” it outputs a MatchInfo object with the properties: .Context, .Filename, .IgnoreCase, .Line, .LineNumber, .Matches, .Path and .Pattern. A Cmdlet like Copy-Item has no idea about MatchInfo objects, but if an object piped in has a .path property, it will knows what it is being asked to work on. If Matchinfo objects named this property “NameOfMatchingFile” it just would not work. It’s telling you that -thing should take pipeline values. So parameters need to be able to handle arrays – something I’ll come back to further down. If the function gets passed a string via the pipeline it is the value for the -pattern parameter. If it gets an object containing a property named “Include”, “Fullname” or “path” that property becomes the value for the –include parameter. Sometimes a function needs to output to a destination based on input: so you can check to see if a parameter is a script block and evaluate it if it is. Delivers, at a stroke, support for Wildcards, multiple items passed in $path and relative names . (b) My function should include $parameter = $parameter -Replace "*","%"
Some tools would require me to type the filtering condition in this form, but I don’t want to remember what prefixes are needed and whether the names are “camera Maker” or “camera Manufacturer” and “keyword”, “keywords” or “tag”. Half the time I’ll forget to wrap things in single quotes, or use “*” as I wild card because I forgot this was SQL. And if I have multiple search terms why shouldn’t they be a list not “A and b and C” (there is a write-up coming for how I did this processing. ). Set sensible defaults. The talk before mine highlighted some examples of “bad” coding, and showed a function which accepted a computer name. Every time the user runs the command they must specify the computer. Is it valid to assume that most of the time the command will run against the current computer? If so the parameter should default to that. If the tool deals with files is it valid to assume “all files in the current directory” – if the command is delete, probably not, if it displays some aspect of the files, it probably can. Constants could be Parameter defaults With computer name example you might write a function which only ran against the current computer. Obviously it is more useful if the computer name is a parameter (with a default) not a constant. In a surprising number of a cases, something you create to do a specific task can carry out a generic task if you change a fixed value in your code into a parameter, which defaults to the former fixed value. Is a type mismatch: f is a fileInfo object and we can’t assign a number to it. The compiler picks these things up before the program is ever run, so users don’t see run-time errors. PowerShell isn’t compiled and its Function declarations don’t include a return a type: Get-Item, for example, deals with the file system, certificate stores, the registry etc. so it can return more than a dozen different types: there is no way to know in advance what type of item Get-Item $y will return. If the result is stored in a variable (with $x = Get-item $y ) the type of the variable isn’t specified, but defined at runtime. Trying to translate that declaration into PowerShell gives something like this. Cannot process argument transformation on parameter 'radius'. Cannot convert value "hello" to type "System.Single". To throw an error, but it doesn’t, PowerShell casts 263.893782901543 to an object representing a file with that name in \windows\system32. The file doesn’t exist and is read-only! So it can be better to resolve types in code. ren '.\100 Meter Event.txt' "100 Metre Event.txt"
There isn’t a way for me to work out what a user means if they specify a memory size which isn’t a number (and can’t be cast to one). If the user specifies many Virtual Machines, catching something during parameter validation will produce one error instead of one per VM (so this would be the place to trap negative numbers too). Incidentally I use the __CLASS property because it works with remoting when other methods for checking a WMI type failed. Allow parts to be switched off In the talk I explained I have a script which applies new builds of software to a remote host. It does a backup and creates a roll back script. Sometimes I have to roll back, produce another build and then apply that. Since I have an up to date backup I don’t need to run the backup a second time so that part of the code runs unless I specify a –nobackup switch. –verbose will echo the message but return true. Prepare your code for other people, including you. I’m not the person I was a year ago. You’re not either, and we’ll be different people in 3 or 6 months. So even if you are not publishing your work are writing for someone else. You, in 3 months time. You under-pressure at 3 in the morning. And that you will curse the you of today if leave your code in a mess. There are many ways to format your code: find a style of indenting that works for you, if it does, then the chances that anyone else will like it are about the same as the chance they will hate it. Some people like to play “PowerShell Golf” where fewest [key]strokes wins – this is fine for the command prompt. Expanding things to make them easier to read is generally good. That’s not an absolute ban on aliases – using Sort and Where instead of Sort-Object and Where-Object may help readability – the key is to break up very long lines, but without creating so many short lines that you are constantly scrolling up and down. # The API takes the amount of memory in MB, in multiples of 2MB. Instead of putting comments next to each parameter saying what it does, move the comments into comment based help, take a couple of places where you have used / tested the command and put them into the comment based help as examples. Your future self will thank you for it. To save having to the create lots of web client objects, I keep a web client object , then one line of powershell gets a PNG file from the Google Service and saves it to the path. Finally I launch the file in the default viewer. 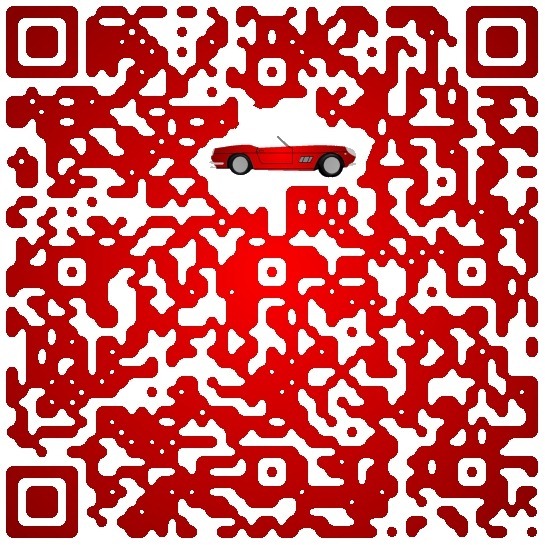 The next step is to use some image tools to pretty up the QR code. I still use an ancient version of PaintShop pro and that does the job here nicely. On the left is the original QR code, in the middle I have applied some gaussian blur to the image and on the right I have reduced this to two colours, 100% black and 100% white. This smoothes off the edges. Then I take the image back to 16 million colours and add some colour. One of the really nice things about QR codes is that they have error correction built in (and in my call to the web service I specify the maximum amount) this means we put something which isn’t part of the code into the picture. I’ve used the Frankfurt skyline from the slide template here, but this is scope for creativity. Of course there is nothing which says the data in the code must be a URL. Here’s a message for anyone who has got a reader. The file name and the Ferrari might be a clue to what it says.